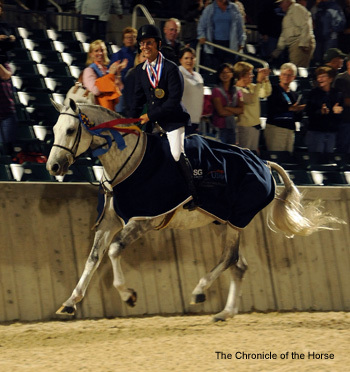 The elegant gray from California, piloted by John French, jumps into the history books with the inaugural finals victory. The hush was almost eerie when Rumba cantered into the Sheila C. Johnson Arena at the Kentucky Horse Park on the night of Aug. 22. 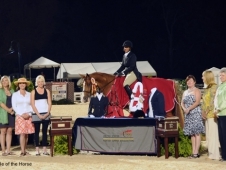 Hundreds of spectators sat in silence, focused on the final starter and class leader in the handy round of the $100,000 ASG Software Solutions/USHJA International Hunter Derby. 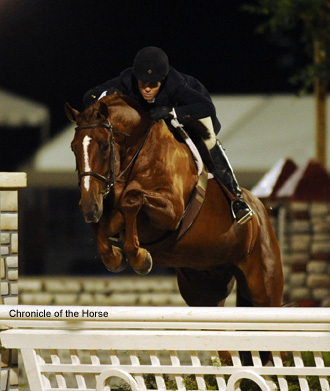 Rider John French knew he had his work cut out for him. 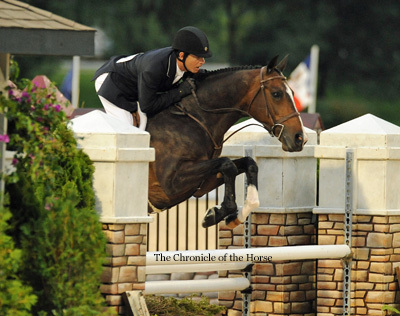 Even though he held a significant lead after Round 1, Jennifer Alfano and Jersey Boy had just raised the bar substantially in the handy round. Their amazing performance, which earned scores of 99, 97, 100 and 99 with bonus points, meant that any mistake could cost French and Rumba the title. French wasn’t thinking about numbers, though. Instead, he was focused on the task at hand. And French did just that. 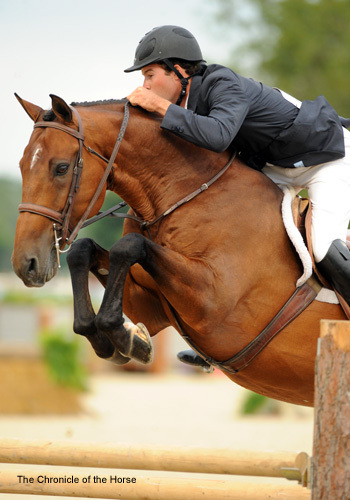 He mapped out his handy plan intending to show off Rumba’s beautiful movement and classic jumping form. He picked up a strong canter from the start, and Rumba jumped the first three fences with room to spare, smoothly executing the rollbacks. 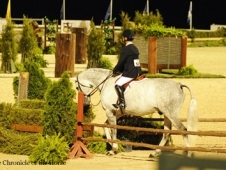 When they approached the double brush fence midway through the course, the skinny fence that had caused two previous run-outs, French rode it confidently. 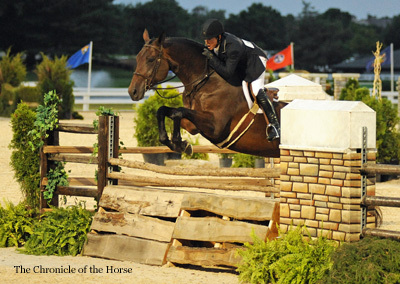 The last major test on the course included the final three fences, which allowed riders to choose the options of heights, lines and approaches. Here, French wasn’t conservative. 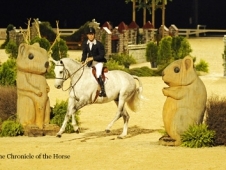 Rumba focused solely on French and cleared the final cordwood fence with ease to the resounding cheers and whoops from the enthusiastic spectators and to the appreciation of more than 30,000 viewers who watched the live feed on www.EquestrianLife.com. 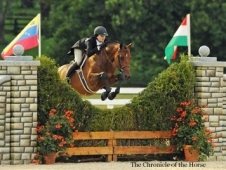 Their handy round scores were good enough to clinch the victory by 6 points over Alfano and Jersey Boy, with junior Laura Pfeiffer and Foreign Encounter leapfrogging from ninth to third with a spectacular handy round. In the end, though, it was Rumba who made the biggest impression. 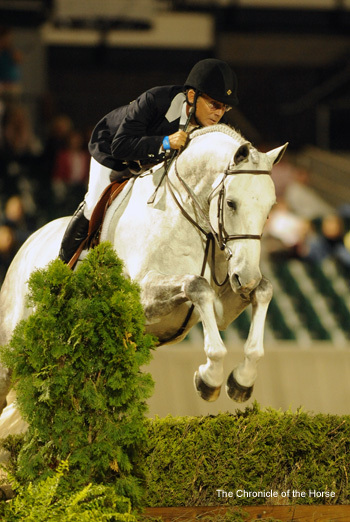 “He’s a fabulous jumper and a beautiful mover and was magnificently ridden. What else can you say?” noted judge George Morris, who presided over the class with Danny Robertshaw, John Roper, Jimmy Torano, Linda Hough, Jim Clapperton, Julie Winkel and Ralph Caristo. 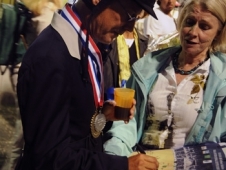 The inaugural derby finals drew 54 starters to the Kentucky Horse Park on Aug. 21-22. The format included a qualifying class on Friday morning in which the top 25 were invited back with a clean slate for the classic round on Saturday evening. 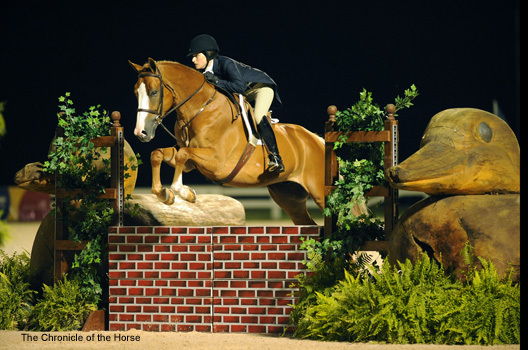 Then, the top 12 from the classic round contested the handy class later that night, with the two scores combined for overall placings. 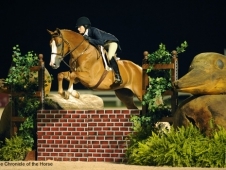 The derby finals were held in conjunction with the Kentucky Hunter Jumper Association Horse Show, and some riders chose to compete during the week while others saved their horses for the derby finals. French was of the latter mindset. Indeed, Rumba wowed the crowd and judges to earn 367 points with a 90, 93, 92 and 92 with no bonus points offered in the qualifier. 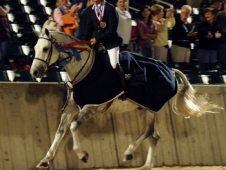 French, Redwood City, Calif., has ridden Mountain Home Stables’ 9-year-old Danish Warmblood in four derbies with two victories this season. He said Rumba always rises to the occasion. 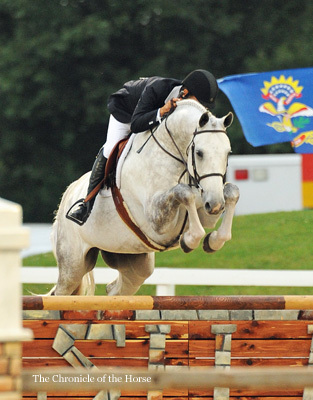 Five points separated Rumba from second-placed Early Applause and Maggie Jayne, with junior Jessica Springsteen and Tiziano taking third with 357 points. 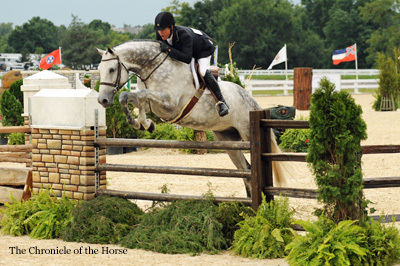 Course designers Bobby Murphy and Patrick Rodes received rave reviews for all three of their derby finals courses. There were few surprises in the qualifying round, although Alfano and Rock Star, who had nine derby starts and two victories over the season, weren’t in sync and didn’t make the cut. 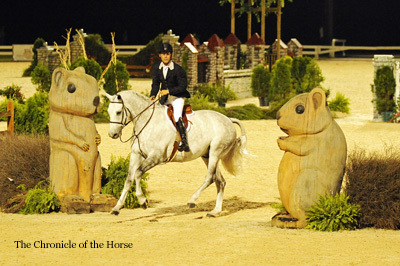 After the qualifying class, the riders of the top 25 horses drew for the following day’s order of go. Because Peter Pletcher (four) and Maggie Jayne (three) each had multiple mounts, they drew first, then riders drew in the order in which they’d finished in the qualifier. 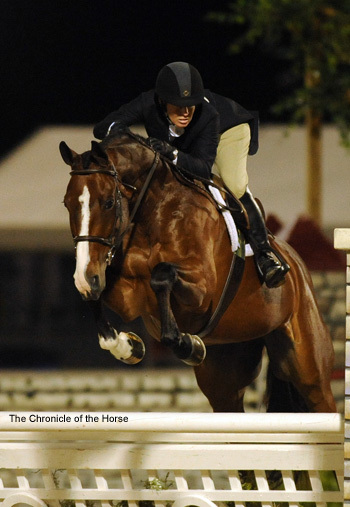 On Saturday afternoon, the top 25 horses jogged for soundness in front of the ground jury and veterinarian. Although several handlers were asked to represent their horses, all passed. 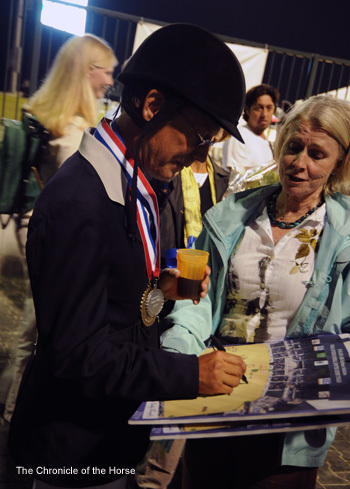 As riders walked Saturday evening’s classic round course, rolling clouds spritzed rain, but it didn’t dampen the enthusiasm felt for what many people considered the first true “grand prix championship” for the show hunters. 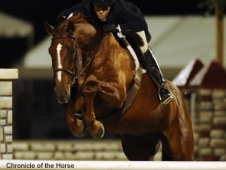 At the class began, the sky cleared, and the gleaming hunters showed off under the lights before an appreciative crowd. And once again they went wild for Rumba, who rose to the top with a stellar performance that earned scores of 90, 90, 93 and 90 from the eight judges sitting in pairs around the stadium with bonus scores of 10, 9, 9 and 9 for style and movement. 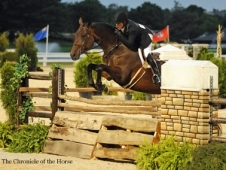 Rumba absolutely wowed the crowd over the final fence, the USHJA signature oxer. 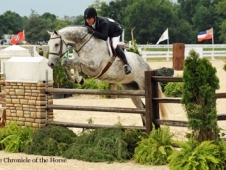 Tammy Provost and Stephen Martines’ Peridot also impressed the judges as they clinched second place with impressive bonus points, including a perfect 10 from the first set of judges. Alfano and Jersey Boy were in ideal stalking position in third with scores of 89, 89, 90 and 89 and bonus points of 6 across the board. 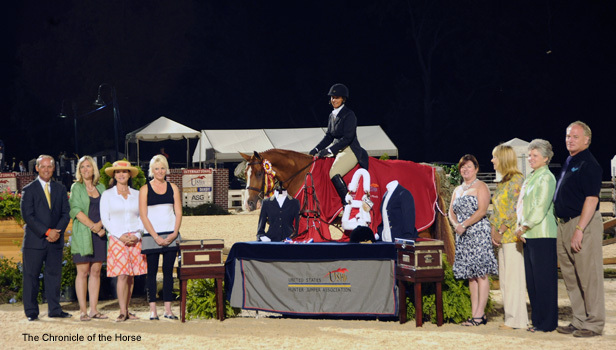 Curtain Call and Courtney Calcagnini, a relatively new face on the national hunter stage (see sidebar), took fourth in the classic round. Their lovely performance, which showcased the chestnut’s beautiful form, was highlighted by Calcagnini’s relaxed and loose style. Now, it was down to serious business. 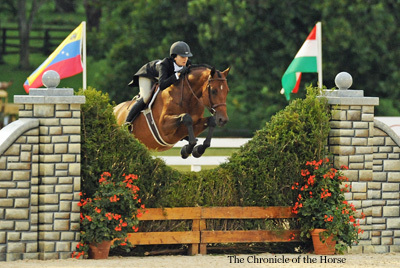 The handy round offered riders many opportunities to showcase their mounts’ specialties. 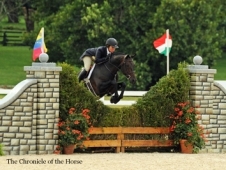 With rollback turns, angled approaches, optional lower and higher fences and different paths to choose, the course offered something for every horse. 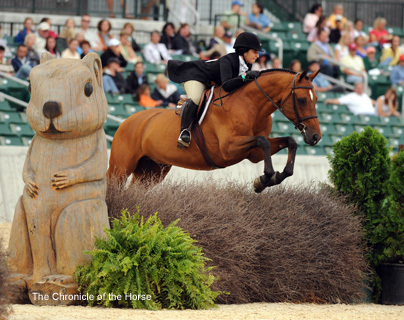 Several fences caused riders pause, if not consternation, during the course walk including a skinny double of brushes, an option of two squirrel tail fences (borrowed from the Rolex Kentucky CCI****) and the dark brown post-and-rails that fell many times during the classic round. The skinny double brush was also part of a second test. After jumping the fence the riders were asked to roll back around to the right, come back to a walk and slip between the two brush elements they’d just jumped. Returning in reverse order, Ebony and Rachel Kennedy, Brookeville, Md., who stood 12th, provided a hint of things to come as they had a refusal at the skinny of brushes. The following three competitors, Pletcher on Camira, Mary Lisa Leffler with Sam Adams and Hardin Towell aboard Castello, had no difficulties there, however. Leffler, Brookeville, Md., and Sam Adams had a beautiful round that was marred by a fallen log of firewood at the final fence. Only one judging panel saw the mistake, however, but that score of 45 prevented Leffler from moving up dramatically in the standings. Laying ninth after the classic trip, Pfeiffer didn’t have an opportunity to watch the first few competitors take a stab at the handy round before her turn aboard Foreign Encounter. But that situation didn’t prevent her from nailing a bold ride that included finessing an almost impossibly tight turn back to one of the squirrel tails. 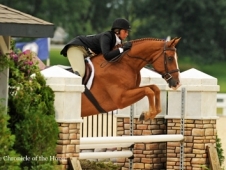 The judges rewarded her with bonus scores of 8, 8, 9 and 7, propelling her to second in the handy and third overall. 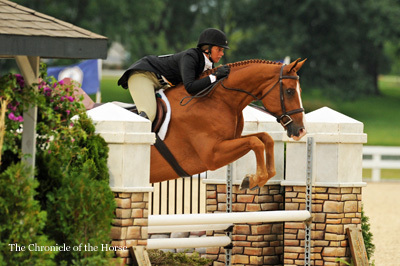 Jayne, Elgin, Ill., and Pony Lane Farm’s Early Applause, who followed in the order, also jumped up the standings with their handy performance. 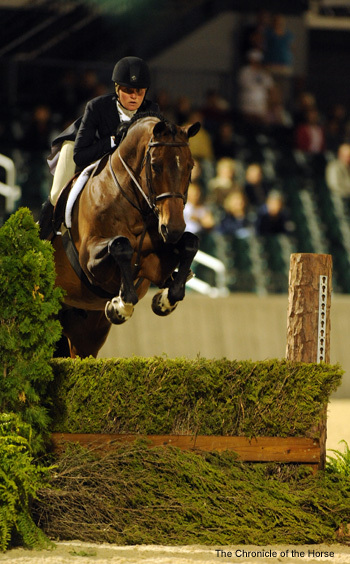 Although slightly conservative, Jayne allowed the talented gelding to show off his elegant form. 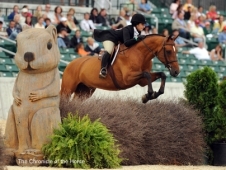 Jayne explained that she knew the leaders would be hard to beat going into the handy round, and she chose to give Early Applause a good round without pushing the young horse too far. 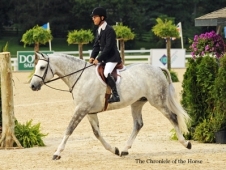 Springsteen, 17, Colts Neck, N.J., and Tiziano, one of the class favorites, were well on the way to an impressive performance when Tiziano bucked and played after a superb effort over the USHJA oxer. Springsteen had to make a wider turn to the double brush fence, and the resulting scores in the 70s left them in sixth place. After Pletcher, Magnolia, Texas, and Dominick received a solid score, Curtain Call and Calcagnini returned to the ring. 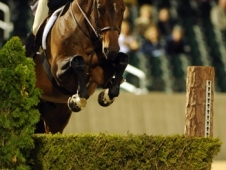 After a lovely start, they misjudged the third-to-last fence, the post-and-rail, became discombobulated and had to cross their path for a technical refusal leaving them 11th. Alfano, Buffalo, N.Y., and Jersey Boy made it perfectly clear as to why they’d won the derby series money-won title this season. She knew she had nothing to lose when she returned for the handy class. 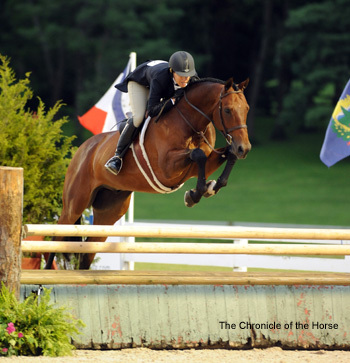 And her incredible riding and Jersey Boy’s scope and jumping efforts didn’t go unrecognized from the judges—Jersey Boy earned the most bonus points in the handy—8,8,8 and 9—to take over the top spot with two horses remaining. “I just went for it,” said Alfano smiling. “He was unbelievable. 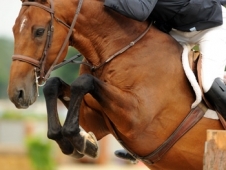 In the handy I felt like I really galloped from the beginning. The jumps felt spectacular. 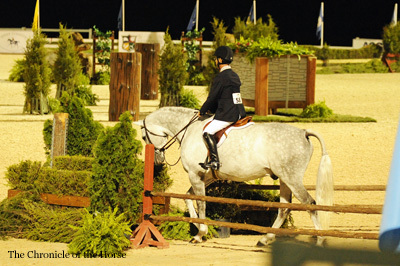 Provost, Westfields, Ind., had a heartbreaking moment with Peridot when they dropped from second to 10th after he took a dislike to the skinny brush fence. 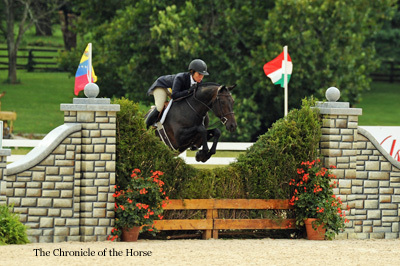 All eyes were on the pair as they cantered under the archway on the way to the first fence. Did French feel the pressure? “People say that [I’m good under pressure],” French said with a laugh. 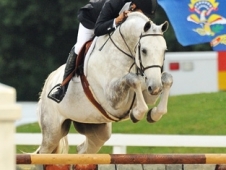 Rumba and French won both hunter derbies on the HITS Desert Circuit (Calif.) and two circuit titles, then the Danish-bred with the registered name Mosegaardens Caramba (Carano—Brandibah) showed lightly through the summer with owner Taylor Seibel in the small junior division and with French in the second year green division. 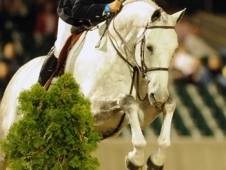 Just prior to the derby finals, Rumba won the $10,000 Grand Hunter Challenge at Menlo Park (Calif.) and was the show’s second year green champion. But French didn’t prepare him specifically for the finals. 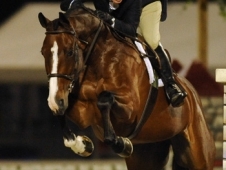 French considers Rumba one of the best horses he’s ever ridden.